Home > Fire Safety & EMS > Fire Safety Evacuation Supplies & Tools > Fire Evacuation Supplies & Tools > Flamecheck™ M-111 Fire Retardant Spray 32 oz. Home > Fire Safety & EMS > Fire Extinguishers - Home, Business & Vehicle Fire Safety > Flamecheck™ M-111 Fire Retardant Spray 32 oz. 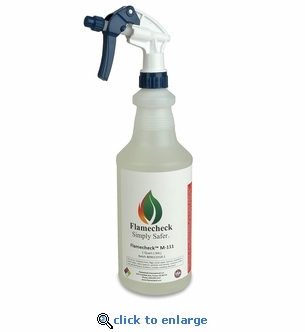 Home > Fire Extinguishers - Home, Business & Vehicle Fire Safety > Flamecheck™ M-111 Fire Retardant Spray 32 oz. 1 Quart of Flamecheck M-111 covers 75-125 sq. ft. depending on the weight of material. This is a universal flame retardant for absorbent materials including; Natural fibers, Natural synthetic blends, Polyester, foam rubber, wood, Christmas Trees, drapes, furniture or any absorbent material. Free ground shipping to the lower 48 states only. Shipping quote needed to ship to AK, HI, FPO/APO/DPO addresses or internationally.